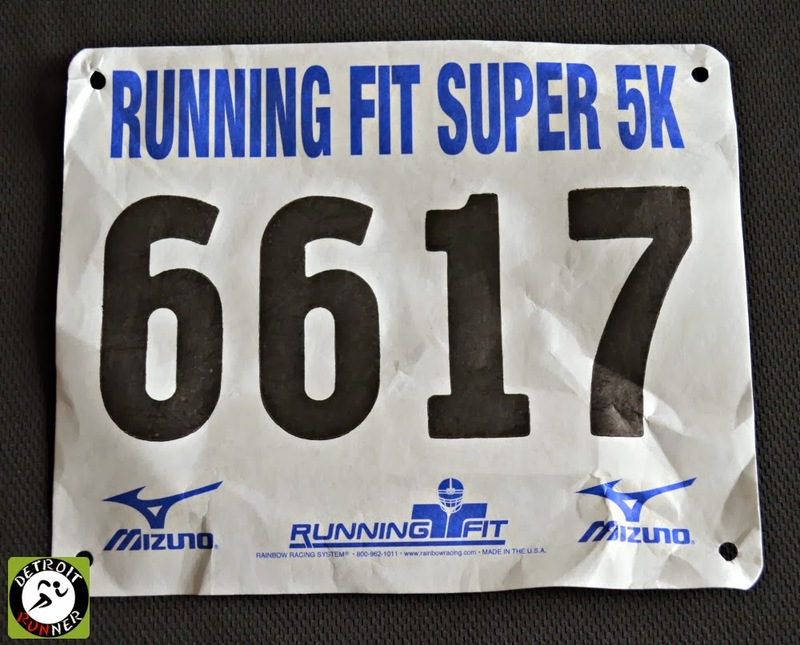 Another great year for the Super 5k Roadrace by Running Fit. The snow the night before made this one of my most difficult 5k's. A beanie, pin, finishers glass and a new medal for the race this year. Organization was excellent. Food was good. Running Fit really did an excellent job with this race and really stepped it up for a 5k. My registration was completed online but you could also print a form and mail it to Running Fit. Online was simple and you just input your information and credit card and you were good to go. Running Fit also had a specific website that had all the pertinent information on there for any questions you might have had as well as a Facebook page with updates. I love when races have both of these because it's very easy to stay informed on any updates the race organization may have up until the race. In regards to packet pickup, you had an opportunity to pickup your packet the day before or the morning of the race. Due to a pending storm on Saturday, and the long drive there, we decided to pick up our packets the morning of the race. Since Trieu and I went to this last year, we knew what to expect except for the drive there. We were expecting 6-8 inches of snow in the area and we ended up getting it. Because of this, we left really early. I was at Kevin's house by 6am and Trieu's home by 6:30am for a 9am start! Fortunately, the weather was not as bad as predicted through the night and morning and the roads were in really good shape - at least the main roads. We ended up getting there just after 7am, a full two hours before the race! Oops! I guess it's better to be early than late. When we got there it was still dark so I took the below picture later on. The event was at the Novi Civic Center like it was last year. A good place for a race especially in the winter. Fortunately, we were not the only people who were really early so we didn't feel like complete idiots. Haha! When you came into the building, the race had the bib numbers set up for you to get your number. They also sent an e-mail around with your race bib number as well so you didn't need to look here if you already had it, which we did. Volunteers could also check-in here too. Packet pickup was not supposed to open until 7:30am but the volunteers were all there early and set up so we got our packet before they officially opened. 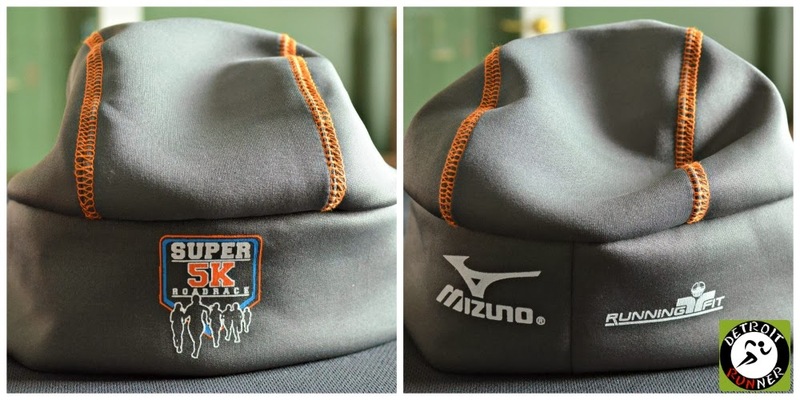 The volunteers gave you your beanie, race pin and bib and you would receive everything else after you finished. I saw Slow Joe working packet pickup, who is the director for the Back to the Beach half marathon at Stony Creek in May, and said hello. That guys is always at races volunteering! Since we had more than enough time to sit around, we looked around the start area and relaxed until it was time to race. Running Fit had a table with the map of the course and parking area as well as brochures on some of their other upcoming races. You had a couple choices for bathrooms as they had the inside bathroom open as well as port-o-potties outside too. There appeared to be more than enough bathrooms for the approximate 2,000 people. It's a bonus to have real bathrooms at the race start. Running Fit had numerous race packets for their races this year including a new series called the Thirsty 3 which I'm already signed up for. It's a race of Beer, Wine and Cider each and looks really fun. That's the theme for my running this year is having fun and the Super 5k was no exception. As time got closer to the start time, you can see the number of runners that attended this event. It's really great of the City of Novi to allow us to use this before the race to remain warm. We also had an opportunity to get a picture with the SEMR(Southeast Michigan Runners) group on Facebook and I got to meet some new people from the group which is nice. With over 1,100 of us in the group, it's difficult sometimes to get everyone together and this was a pretty big group today compared to other races. One of the members, Mandy, in the SEMR group, also works for Running Fit so she was nice enough to announce where we were taking a picture. It would have been difficult given the amount of people there otherwise. After that, it was time to head over to the start. The start is just about a block next to this building. We walk through a parking lot and over to another area where the start is. While you cannot see the start from the building we were in, it's very easy to get to and we didn't start going there until about 10 minutes before the race even with the amount of runners today. It was a bit snowy in this part and I think it would have been nice to have this area shoveled for the runners. As we got there, it was pretty crowded so I made my way up fairly close to the start. I never want to be at the front but I also don't want to be at the back either. Actually we saw Alexis and Sherri as we were getting into line and who we've ran with in the past and started making our way near the front. Alexis(who ended up placing in her AG) and I lost everyone else but ended up getting in a really good spot to race. We literally just got there and they said go and the runners were off starting right at 9am. Since I ran the course last year, I somewhat knew what to expect but there were a few small hills that I didn't remember. I started off fairly strong but the main road, Taft, was fairly clear and we did have some sort of traction on it. 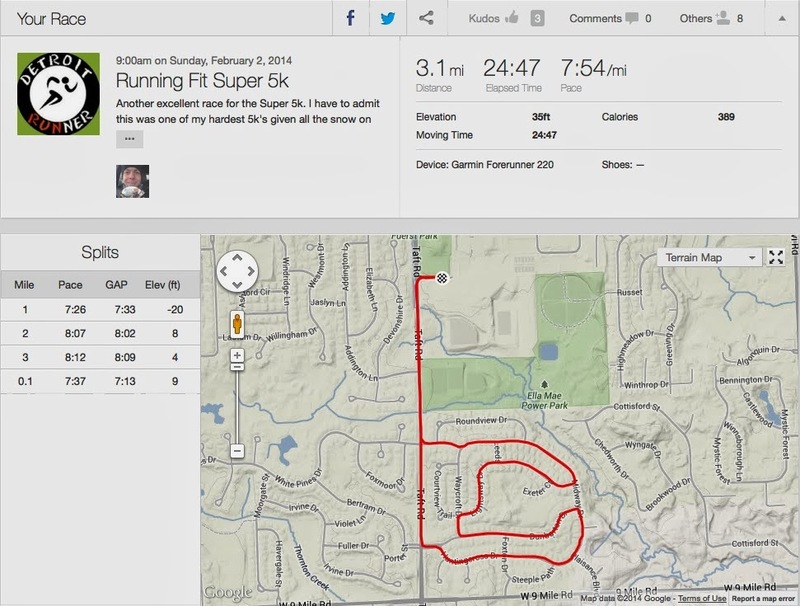 When we got into the subdivision, you can see that my speed clearly slowed due to all the snow in the sub. There was not much traction and I even wore trail shoes. Overall, I'm still fairly happy with this race considering it was probably one of my toughest 5k's that I've done with the poor traction. As you can see below, the roads, while a little slippery, were not really snow covered so you could get a little bit of traction especially if you had trail shoes on. Some runners wore Yak Trax and spikes and while I have both, I didn't think I was going to need them. Wrong! The Novi police were out with the main road closed and while this was not a closed course in the subdivision, there were no residents that I saw trying to get out of the subdivison. It was a very safe course as long as you didn't slip on the snow. As you can see below, the snow gets to be a little more of a problem as you get into the subdivision. Before I knew it, I was already done with the first mile. Running Fit and the volunteers did a great job out there by having plenty of signs and plenty of volunteers to direct you where to go. Not once did I feel like I wasn't sure where to run thanks to all the volunteers. Some of the areas in the subdivision had ankle deep snow which made the course much harder than it was last year. I was much slower this year as I finished last year in 22:59, almost two minutes slower this year. You can see below, the amount of snow still on the roads below. While I was not expecting the race to clear the course, it was certainly unexpected to run in so much snow, so fast. It was have been a big plus had the race plowed the course this morning. I want to make it clear though that I don't feel it's the races responsibility to clear the course. This is Michigan and it is February so running a race in snow should be expected and if you don't like it, don't sign up for this race. I will say I'd be happy if I didn't have to run a race in snow for a long time though. Haha! The elevation is really flat overall, but as you as see in this picture, there is a couple small hills but really nothing that big of a deal. Novi is pretty flat. In fact, had it been clear of snow, you probably would not have even known there was a hill. Well, maybe. As we made our way back out of the subdivision, the roads also started to get better again. Unfortunately, at least for me, I spent all my energy trying to keep pace. I was not able to increase my speed at the end. The finish area also got a little slippery as we made the last turn to the finish. At last, we were back. While I don't want to run every race in the snow, I did enjoy this and it was a Super workout so we don't feel guilty about eating during the Super Bowl. 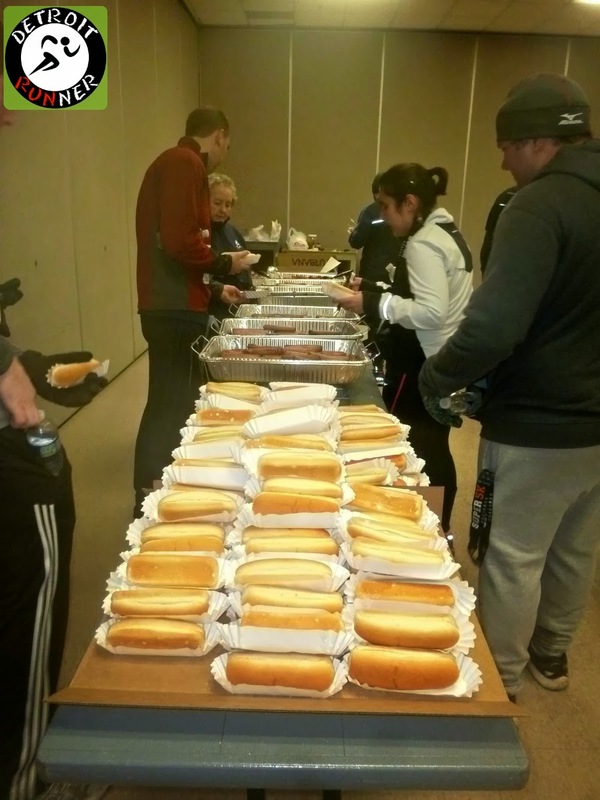 Finally, after four 5k's this winter, Running Fit was the only company that stepped up and had an aid station at the halfway point. As I've said, it's not a necessity for a 5k to have one, and I didn't use it, but it is much appreciated by many runners/walkers. 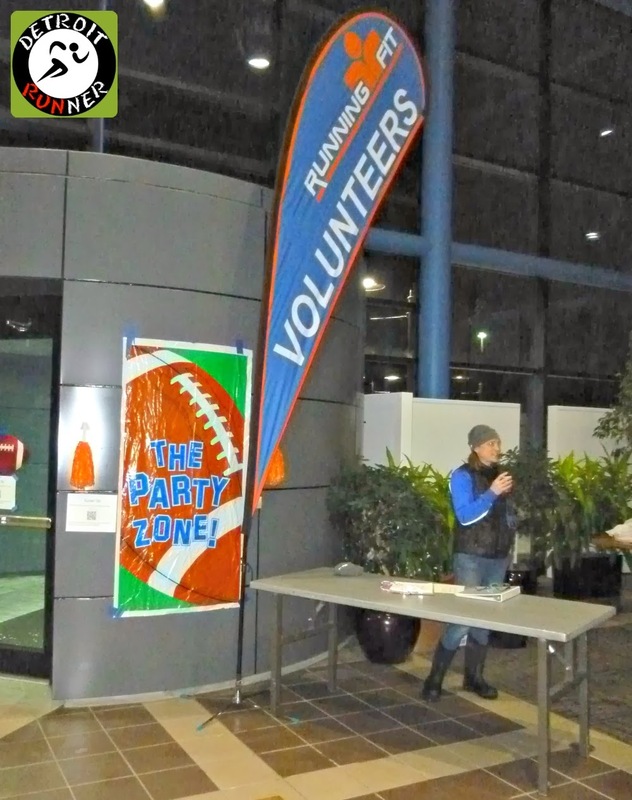 Those volunteers must have been really cold out there and they were great to be out there helping us. After you finished, there were volunteers there keeping the traffic of runners moving, a volunteer gave you a water bottle, another gave you a finishers glass and another gave you your medal. The process worked very smoothly and there was even room for spectators on the sidewalks to wait for their runner. Before we headed back to the post race celebration, we made a stop to the car to drop off our finishers glass. This year, just like last year, there were many runners who dropped their glass. I'm not sure why people even wanted to carry them around since our cars were literally feet from the building of the post race party. We then headed inside for the food and see where we stood in the race. The race had hot dogs, meatballs, cookies and brownies to eat as well as bananas. As I mentioned last year, I still don't understand why the race does not offer anything warm to drink. A nice warm coffee would have been great. Regardless, the post race food was fantastic and it's nice to finish the race with something other than the typical post race food. 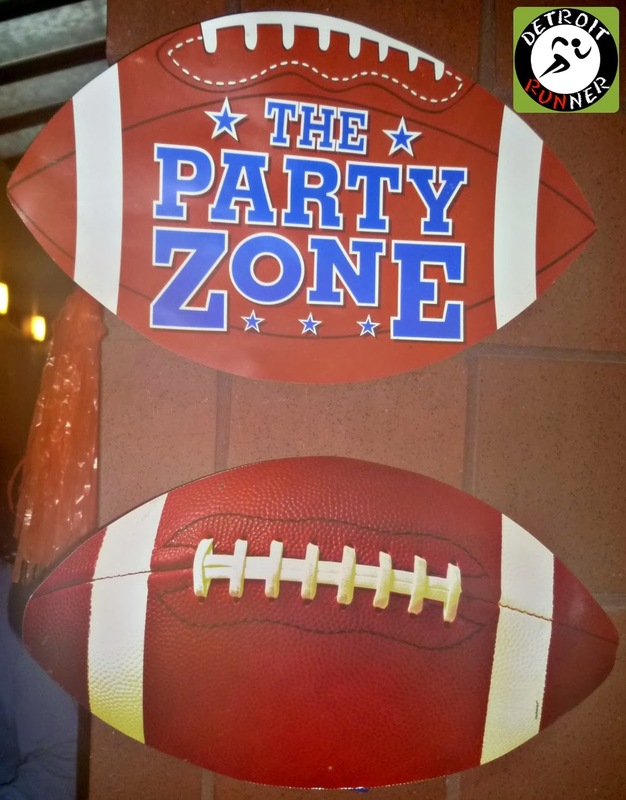 Given the Super Bowl theme, how could you not end with junk food? The food area had six lines for all the runners and it seems to move very quickly. While I realize I'm one of the first to get into the area, even when we were out for some time, I took a look to see how things were moving and the line continued to move nicely even for people later in the race. Volunteers did a great job keeping people moving as well. After we got our food, we were checking results on our phone with a QR code reader. The race supplied a QR on some sheets and then we listened to some of the age group awards as we ate our food. Unfortunately, none of the three of us won. This race had some strong competition! 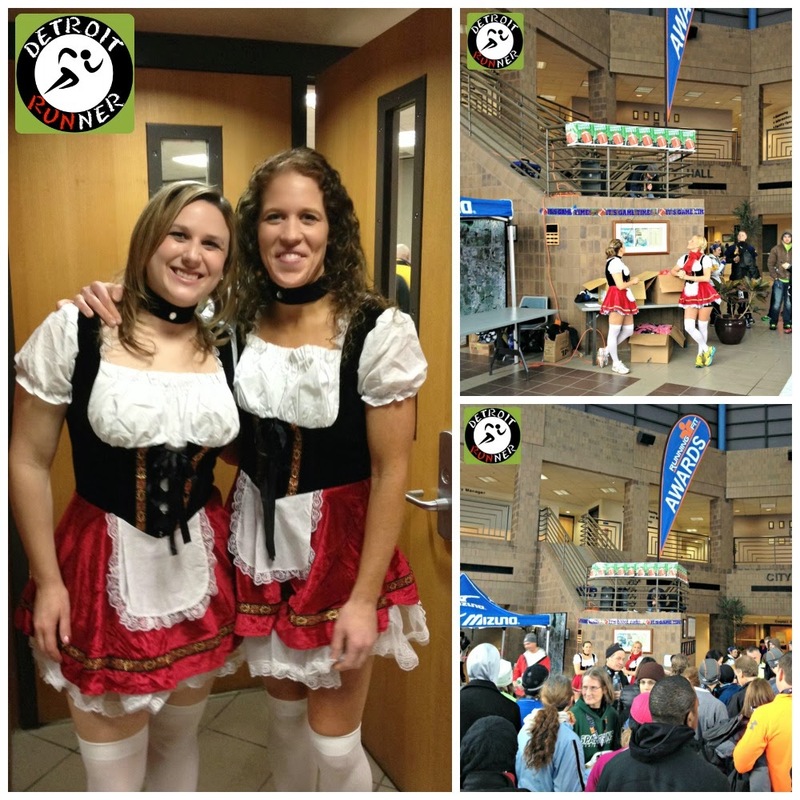 The race had four girls dressed in St. Pauli Girl type outfits giving out the age group awards. I'm not sure the connection with Super Bowl Sunday but, hey, who was I to complain? Haha! St. Pauli girls giving away AG awards - sounds good. I registered for the race before prices increased so my total cost was $34 + $2.50 processing fee online($36.50 total). While some may say that is expensive for a 5k, for everything you received, I think the value of this was incredible and still wonder how they could even keep the race cost this reasonable. You received a chip timed course that was partially closed with one aid station. 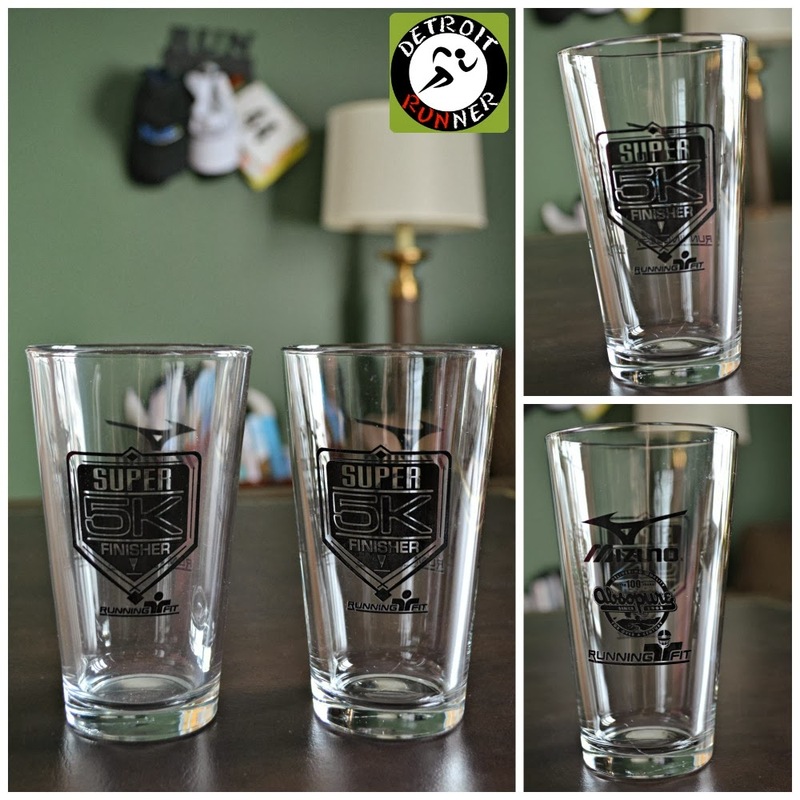 It included a nice tech race beanie from Leslie Jordan, a Running Fit Super 5k pin, a finishers glass and a very nice medal and some great post race food with an awesome Super Bowl theme. The tech beanie is nice quality and similar to last years beanie except this year it was grey versus a black one last year. I used last years beanie over the last year and it does keep you warm although I'm partial to Headsweats. The race also offered finishers glasses again this year. As you can see, they are exactly the same as last year. While I don't mind it being the same design, it would be nice to offer a different color or a date to differentiate from a previous year. New this year was the finisher medal. I really love the medal! While I don't expect a medal for a 5k, it was a really fun one this year with a great design. I expect that many this year signed up just to get this and it was certainly one of the things worth running for today. While it's hard to tell, this is a substantial medal and it's not made cheaply. It also has a really nice ribbon. It would have been nice for them to put the date on it somewhere, however, I'd have to say it's the nicest medal I've ever received for a 5k since I started running. They did a great job on this. New medal - very nice! The organization was excellent. The communication was great with a very clear website and Facebook page. They gave you e-mail reminders/information about the race as well. There was no reason any runner would not know what was going on. The parking was easy and had volunteers there to direct you. The packet pickup was very organized and easy to get the day of the race. The venue is nice as you can stay inside until just before the race start. It would have been nice to see the sidewalks shoveled between the packet pickup and the start area but other than this issue, I thought everything went off very well. The course was clearly marked and had plenty of volunteers. They made several announcements prior to the start. It was a little difficult to hear the person calling off age group awards but you could also check it on your phone so you would know if you placed in your group or not. I would expect nothing less from Running Fit as they have been doing races for years and continue to get better each year. 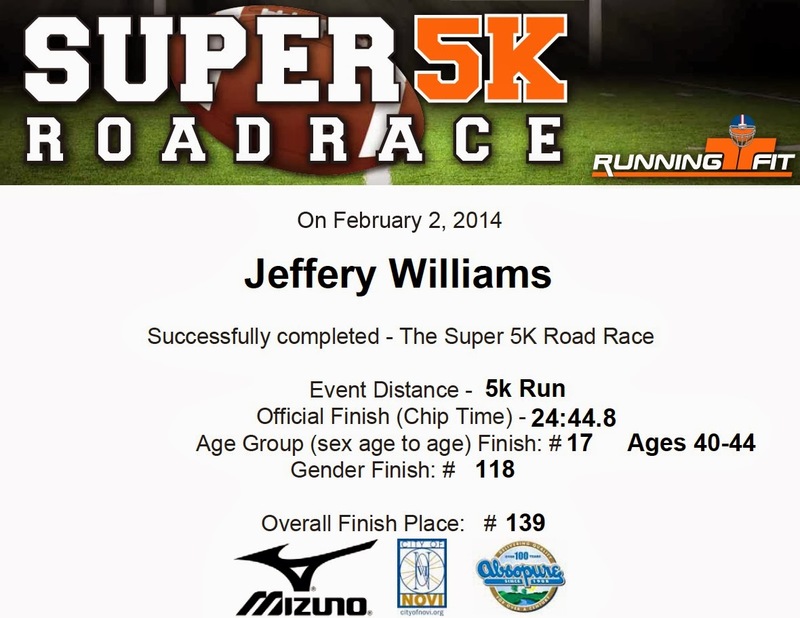 Overall, this was a really fun, well organized, Super 5k. I think that Running Fit really stepped it up this year and went well above what many 5k races do for it's runners. They clearly have shown that they want to continue being a major player when it comes to offering superior races and this was a fantastic start to their races in the Detroit area for 2014. I'm currently signed up for four additional races this year with them including the Trail Marathon half in April, the Hightail to Ale 5k in May, the Running Between the Vines half in August and the Scrumpy Skedaddle 10k in October and I can't wait to run each of them. I would absolutely consider putting this race on my list for future years and, if you have not run it, it's one you should consider running too. Note: I was not paid or compensated in any way for this race review. All opinions are my own. Nice job in some not so fun racing conditions!! I've run in the snow, but not in a race I was trying to run fast (like a 5km) what shoes did you run in, or normal shoes with yak-tracks or spikes? What sort of time did the winner do? The winner was 17:42 coach. A couple minutes slower than typical so that's why I'm not disappointed. I ran in trail shoes but should have worn Yak Trax or spikes.